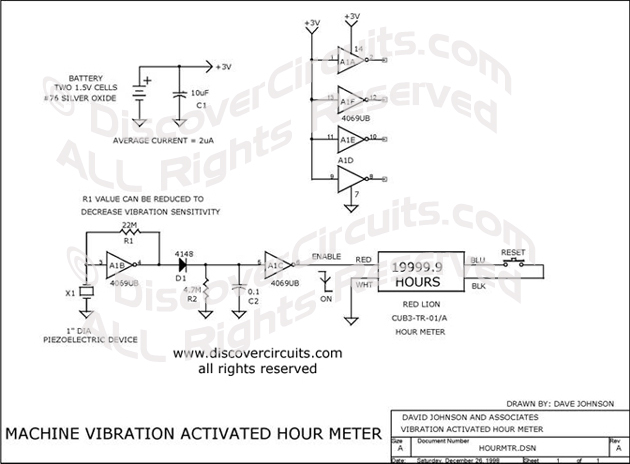 Circuit: MACHINE VIBRATION TRIGGERS HOUR METER __ Circuit designed by David A. Johnson, P.E. Battery powered digital hour meters are often used to monitor how long a particular machine is placed in operation by detecting when the machine is supplied with power. However, it is often difficult or dangerous to connect a battery powered hour meter to a line powered machine. When the machine being monitored produces detectable vibrations, the circuit shown can be used without requiring any power line connections. The circuit shown uses just one IC and allows a battery powered hour meter to be turned on and off, according to a machine's operation. Machine vibrations are detected with an off-the-shelf one inch diameter piezoelectric device. Such devices are often used as alarm beepers or sound generators. The signal from the piezoelectric device drives a simple Amplifier, using one section of a CD4069UB C-MOS hex inverter. The output of the first stage Amplifier is then rectified and filtered using a diode, a resistor and a capacitor. It is then connected to a second stage, acting as a logic buffer. The output from the second stage drives the digital hour meter with a +3v to ground swing. The 3 volts to power the circuit can be obtained from two #76 silver oxide button cells. Since the circuit only draws about 2uA, the two cells should power the circuit for about 5 years. You can also tap into the 3 volt Lithium battery used in the digital hour meter.